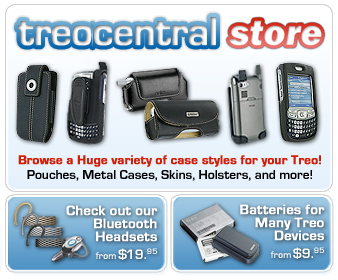 treocentral.com >> Stories >> Commentary >> Is the Smartphone the New Laptop? Is the Smartphone the New Laptop? InformationWeek has an interesting article about how smartphones are becoming over-the-air portals to enterprise apps, and why they could push the laptop aside. Alexander Wolfe from InformationWeek asks, "Can we really ditch our Windows-powered portables when we travel, in favor of BlackBerry, iPhone, Windows Mobile, or Symbian-powered handsets?" That is an excellent question. If I was a business exec and traveled a great deal of time, I would certainly like to be able to depend on my smartphone rather than lug around a laptop. I think we all would. And with all the enterprise software that is out now for our smartphones, more and more business execs are probably relying less on their laptops everyday. Wolfe says that many professionals in three years' time will probably be able to access their companies' Oracle, Salesforce, SAP, or Sybase apps from a lightweight mobile interface. He asks the question, "What's the reality today?" to three categories of stakeholders: IT organizations, enterprise software vendors, and cell phone platform suppliers. Further into his article, Wolfe talks about RIM, noting that its biggest selling point - in addition to its 1,000 enterprise independent software vendor partners - keys off its pionieering work in "push" technology. Alan Panezic, VP of software product management at RIM, sees a connection between push and how mobility is respinning enterprise apps. "The challenge that most CRM systems have is getting the people who need to use it to actually want to use it," Panezic says. "What we've done is create a beautiful push experience. If a user calls one of their contacts, a screen pops up afterward and says, 'Hey, did you want to tie this to a CRM event?' If you've got a contact in your BlackBerry, it gets tied to your SAP contact, and vice versa." InformationWeek did an online survey of 1,139 business technology professionals. 30% of smartphone users say that they use their devices for enterprise connectivity, while 37% either occasionally or frequently leave their laptops at home in favor of their smartphones. Wolfe says that many more users would like to leave their laptops at home when traveling, but they're afraid of being caught short. Wolfe gives examples of some organizations who are utilyzing smartphones in broader roles. The organizations he mentions are General Motors, University of Pittsburgh Medical Center, Dreyer's Grand Ice Cream, Astra Tech, Oracle, Saleforce, and Sybase. I thought the reference to Dreyer's Grand Ice Cream was interesting because The Palm Treo 750 is being used by 50 field sales reps to access the company's back-end CRM database. I enjoyed reading Wolfe's article because I read all the time about people talking about their smartphones replacing their laptops. My Palm smartphones could probably replace my laptop for a number of tasks such as email, reading and writing word documents, categorizing photos, setting up appointments, and downloading software. I still rely on my laptop for surfing the Internet and watching videos. However, when I had my iPhone, I could pretty much depend on that device for those two activities. I think that when more smartphones have larger displays and better web browsers, more and more people like me will rely on their smartphones almost entirely. But for now, would I leave my laptop at home while traveling for business or pleasure. Not a chance. I'd have both my laptop and my smartphone with me. Head over to InformationWeek and read the full article.